Does Trans Fat Leave the Body? Before the 1990s, doctors and public health officials warned against consuming saturated fats, prompting food establishments to switch from lard, an animal fat, to new partially hydrogenated oil products made from vegetable oil. By the early 1990s, trans fat accounted for 4 to 7 percent of the average person's calorie intake in the United States, according to the Harvard School of Public Health. 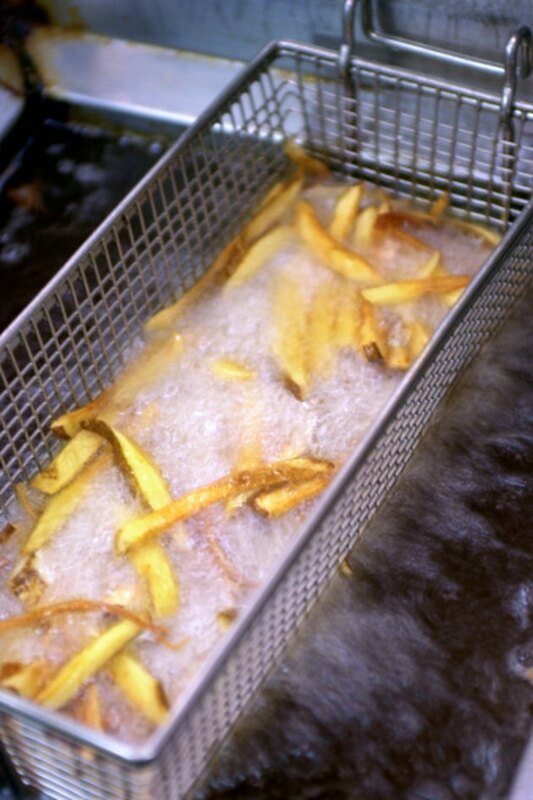 By the late 1990s scientists discovered the detrimental health effects of trans fat. The human body does not need trans fat, nor does it process it effectively. Although not all trans fat stays forever in the body, the ill effects it causes leave a lasting effect. The term trans fat refers to the structure of the carbon, hydrogen and oxygen molecules within the fat. Meat and dairy products from animals classified as ruminants, like cows, goats and sheep, contain a small amount of natural trans fat, but the majority of the trans fat comes from a man-made process. Food manufacturers discovered that they could add hydrogen to an unsaturated fat like vegetable oil. The result is a partially hydrogenated fat that can withstand repeated heating and does not spoil. But adding the hydrogen atoms changes the fat, and the lipase enzymes in your body cannot break it down effectively. Dietary fat, including saturated fat and trans fats, increases cholesterol levels in your body. Research published in the "British Medical Journal" reports that trans fats cause a more adverse effect on cholesterol than saturated fats. Trans fats cause low-density lipoprotein, known as the bad cholesterol, to increase, which increases your risk for heart disease. Trans fats also decrease the level of high-density lipoprotein, or HDL, known as the good cholesterol, according to the American Heart Association. HDL helps remove cholesterol from the blood vessels so it helps reduce your risk for heart disease. This double effect on cholesterol makes trans fat double trouble when it comes to the health of your heart. Your body tries to regulate your cholesterol level and some cholesterol, and therefore fat, leaves the body. Cholesterol travels through your blood vessels attached to the specialized proteins, with LDL carrying the majority of the cholesterol. HDL picks up cholesterol from your tissues and blood vessels and carries it back to the liver. The cholesterol binds to receptors on the liver cells, the liver cells absorb the cholesterol and use that cholesterol to produce bile acids. The liver secretes the bile acids with the bile, a mixture of electrolytes, water and bilirubin, to the gallbladder, which stores it until needed by the small intestine. As food enters the small intestine, the gallbladder releases bile, which helps break down fat molecules. The bile with some fat, but not all fat, gets excreted from the body with the stool. Although your body needs fat to function, to store energy, to provide structure to cell membranes, to absorb vitamins and to make hormones, it does not need any trans fat. For this reason, the Institute of Medicine advises consuming as little trans fat as possible. The American Heart Association recommends consuming less than 1 percent of your daily calories as trans fat. Many types of foods can contain trans fats, including cookies, cakes, crackers, fried foods and margarines. In 2006, the U.S. Food and Drug Administration began requiring food manufacturers to add trans fat content of the food to nutrition labels. What Role Do Lipids Play in the Human Body?